Cooking vacation: a chance to get to know the local herbs and spices. 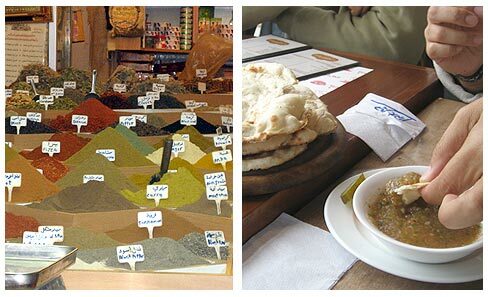 A culinary tour in Israel will inevitably acquaint you with the large selection of herbs and spices in the country. 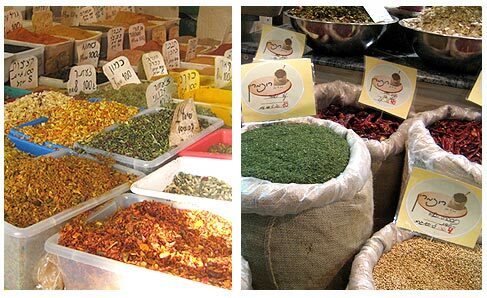 Israelis have a strong link to the local herbs and spices. This link, so enriching the present-day cuisine and every Israeli table, stems from antiquity. In those days, man was closer to Nature. In the Eastern Mediterranean, most people lived off the land. Agriculture was the main occupation and the local herbs were used both for cooking and for medicine. The Land of Israel, the ancient homeland of the Jewish People, was blessed with many herbs. The ancient texts mention some of them such as dill and corianders, oregano and marjoram, myrtle and thyme. All of them were grown specifically for culinary and medicinal uses. The Talmud even gives precise instruction for planting and watering these herbs, so important for the local cuisine for the last 3000 years. 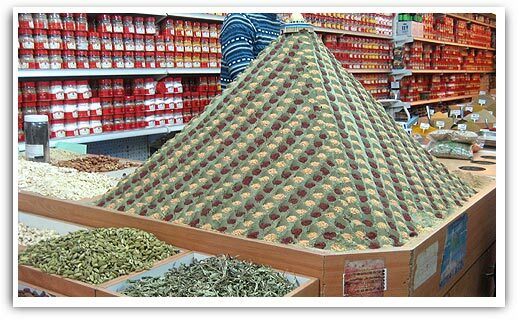 It is no surprise, then, that Israel has a flourishing industry of herbs and spices and is one of the largest exporters of herbal products and condiments to Europe and the US. The Israeli cuisine makes extensive use of fresh herbs. In almost every house or balcony, even in the large cities, herbs are grown to make infusions or as spices in everyday dishes. Walking the streets of Tel Aviv during your cooking vacations, just raise your eyes and look at the balconies and you will see mint and basil peeping at you. Fresh herbs used for adding taste to dishes are a healthy, real and refined way for those of us who wish to avoid using soup powder or condensed industrial spices. 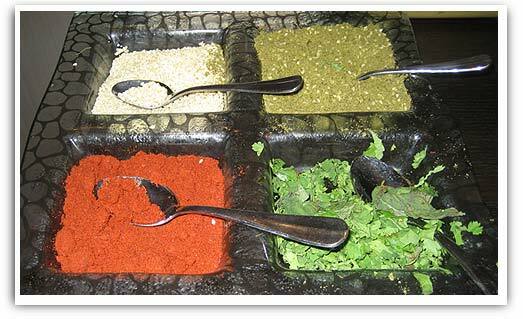 Naturally, during our cooking vacations, we will use these herbs freely for taste and scent. Za’atar. Za’atar is probably the biblical “moss” mentioned since the days of King Solomon. It is closely related to oregano, marjoram and thyme. Natural medicine uses it as a well-proven disinfectant and as an aid in reducing headaches. In the kitchen, Za’atar is suitable for practically all the Middle-Eastern dishes, and upgrades even a freshly chopped vegetable salad. Take some toast, rub a clove of garlic on the toast, sprinkle olive oil and crushed tomato and add a generous amount of Za’atar on top. Coriander. Coriander is mentioned in the Bible from the times our forefathers went to Egypt. It is a well-known remedy for stomach aches and strengthens the heart. In the kitchen it is used, mainly fresh, in a wide variety of dishes. The chopped fresh leaves should be added just before the cooking is done. Sage. Sage is known to be originally from the Middle East. It was brought to Europe by the Roman soldiers who conquered Palestine. Natural medicine believes it lowers the blood-pressure, helps fight the common cold and gum infections. Some even produce a perfume based on sage. In the kitchen we have to use it with care, avoid adding to much sage since its strong taste tends to dominate the dish. It’s a good idea to add it to meat dishes and even to pasta with a fine sauce of olive oil, sage and garlic. Mint. Mint, or its locally known variant Na’ana, is known the world over. It is originally from Greece and is known from ancient times all over the Middle East. Natural medicine uses it to relieve throat aches. Many Israelis drink tea with na’ana. In summer it is customary to serve cold water with mint leaves and lemon in every restaurant or café. The Arab tabouleh salad uses na’ana as you can see in the recipe included in the cooking workshop in the Arab Galilee culinary tour. For example, it’s a good idea to add na’ana leaves to fish kebabs. Parsley. Natural medicine uses it to treat problems in the urinary system. Yet, it is best known for its place in the Israeli cuisine. Sometimes it seems that without parsley, there is no Israeli cooking… It is used in copious amounts in practically every dish (tahina, tabouleh, salads, hummus…). Thyme. Thyme, the poets’ and chef’s beloved spice. Natural medicine uses it to calm cough and to relax strained muscles, if used in a bath. In the kitchen it’s delicate taste makes it suitable almost for any dish. Thyme is good for a meat roast or for roasted vegetables, finds its place in pasta and even in ice-cream. Rosemary. Rosemary is a very adaptable plant. Driving along the coast or walking in parks during your cooking vacations, you will see it everywhere. Rosemary oil is good for the scalp and strengthens your roots. In the kitchen it is widely used but you have to be careful: it has a strong taste. It can be added to meat dishes, and you can use its branches as skewers and even place it on the grill so its scent is blended with the kebabs. In addition, you can add rosemary to any marinade. Basil. Natural medicine uses basil to treat stomach aches, nausea and vomiting. In the kitchen it is synonymous to a good match. You can add it to practically any dish, preferably fresh including vegetable salads or rice and of course, you can chop it to make pesto. We will meet all these herbs and spices, and many more during the workshops in the cooking vacations and culinary tours and learn how to use them to make savory dishes and drinks.